When Assistant Special Agent in Charge Tammi Miles was in training as the lone African American woman recruit at the firing range in 1995, she learned to shoot a gun. However, she obtained other lessons about the importance of diversity and inclusion as well. "I was told that I would likely not be able to shoot well or become a law enforcement officer because I was a woman," she said. "But that discouragement did not stop me. No way." Instead, that sexist naysaying early in her career fueled a desire in Miles to excel - and to support other women and recruits of color throughout her career. In fact, the feisty rookie went on to become a sharpshooting firearm instructor with the Federal Law Enforcement Training Centers (FLETC). "I tell my story to young women and others in law enforcement: I mastered a skill I was told I simply could not attain," said Miles, who joined the Department of Health and Human Services Office of Inspector General (HHS OIG) as a special agent in 2000. "This is a challenging career for anyone, but with a virtuous mindset and hard work, it's a career people from different parts of society can thrive in." Not only can people of both sexes and many backgrounds master such law enforcement skills and talents, but these differences bring advantages as well, she said. "The bad guys and the victims reflect the diversity of society, so why shouldn't the good ones?" she said. Law enforcement has gotten increasingly sophisticated; therefore, diversity and inclusion work for obvious and subtle reasons. "Many women have a softer - some call it maternal - side" that can encourage otherwise untrusting defendants to share information, a crucial skill in law enforcement. Agents who come from the Armenian or Russian immigrant communities can leverage their language skills and cultural insights to achieve great results, she said. She added that one's characteristics - gender, ethnic heritage, and age - can inspire approaches that strengthen the ability to fight fraud. "The criminal justice field benefits from different insights and techniques. Some of our newer agents fresh out of school have a tech-savvy that we're glad to have on board," she said. For those who wonder why HHS OIG agents need to carry guns, Miles pointed out that she has never in her 18-year career executed a search warrant without discovering a gun on the premises. Plus, many who are being investigated are wary or hostile about law enforcement. "When we conduct a search, people see us as the police and they think they're facing the possibility of jail time," Miles said. Every day, HHS agents have to be prepared for any contingency. "Every time you go out on an interview or warrant, you need to be prepared. Complacency and hesitancy will get you killed," Miles cautioned. "Interview a sweet granny in her living room about how her Medicare card was stolen, and her not-so-sweet grandson may come up from the basement to surprise you." 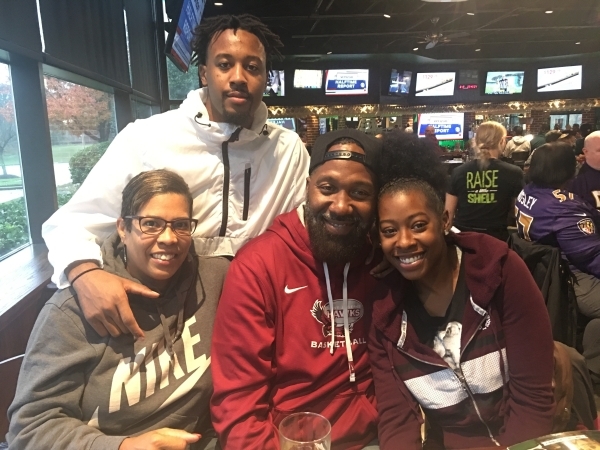 Born and raised in Baltimore, Maryland - with a few years spent in Los Angeles - Miles earned a bachelor's and master's degree in criminal justice at Coppin State University. She was following in her grandfather's footsteps, who had been a longtime police officer with the New York Police Department. She began her career in law enforcement as a postal police officer, one of the first officers trained at FLETC. A fellow postal police officer left for a position at HHS OIG and encouraged Miles to join him at the agency. "I didn't know anything about HHS OIG at the time, but I trusted [my former colleague]," Miles said, quickly adding: "I'm glad I did because I really love my job. Ask anyone." Sometimes bulletin boards heralding monthly celebrations are a nice, if tame, way to commemorate a particular issue. 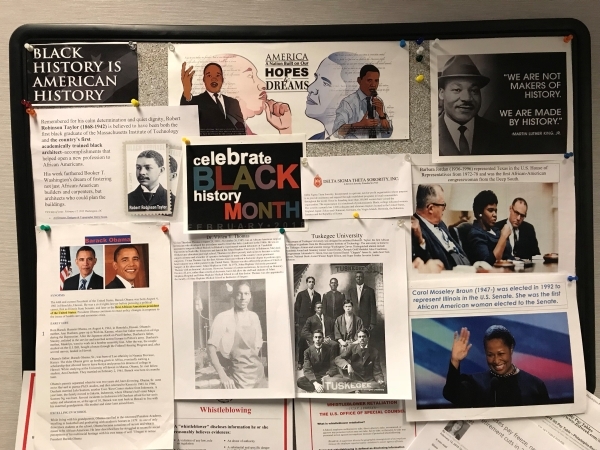 For Senior Auditor Anita Parker, who has been creating and recreating her Black History Month boards in Region III Philadelphia offices on a weekly, sometimes daily, basis, the boards are a passion. "My goal is to include the fantastic and unique achievements by African Americans to this beautiful country of ours," she said. "It's important to celebrate black history, which is everybody's history." She scours magazines, Facebook posts, and other sources for her boards. Parker always features civil rights leader Dr. Martin Luther King Jr. Also likely to be featured is Dr. Vivien Thomas, an African-American surgical technician who developed the surgical procedures used to treat blue baby syndrome (now known as cyanotic heart disease) in the 1940s. Raised in Mobile, Alabama, Parker's parents were always supportive, stressing the accomplishments of African Americans. "My parents instilled pride in me. I have always been proud to be an African American," she said. "Their support and guidance helped me get through some of the southern hostility [I encountered]." Her family also values community service and empathetic gestures, such as her father's barbecue dinners. Famous in her hometown, the barbeque dinner welcomes everyone to join her family for a nourishing meal and warm company. Always talented in math, Parker received her degree in accounting at Alabama State University. Since college, Parker has been active in her sorority, Delta Sigma Theta Sorority, Inc., which has more than 200,000 members worldwide. "I became a member of Delta Sigma Theta Sorority, Inc. because I wanted to join women like me who were committed to the constructive development of its members and to public service with a primary focus on the African American community," she said. Learning and serving others describes Parker's career as a federal auditor as well. After a stint with the U.S. Government Accountability Office doing auditing work, Parker realized she preferred auditing to accounting because the former allowed her to travel and meet new people, and tackle a variety of challenges. "I like to help people and I do this by learning ever changing things about Medicare and Medicaid. That's why I love auditing, because I can broaden my horizons," she said, noting that studying HHS programs like Medicare helped her understand how to support her parents as they grew older. "I'm proud to go to these sites on audits representing HHS to ensure that taxpayer money is not wasted and that beneficiaries are receiving the services they are entitled to," she said. "I can be the voice of vulnerable people who do not have a voice. They're someone's daughter, son, mother, or father."